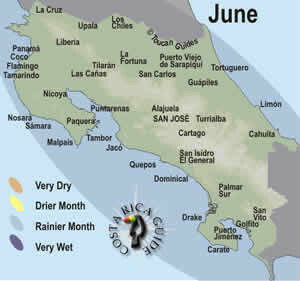 Costa Rica June rainfall patterns. It’s the start of the rainy season across the country. or see when should we go? If you want to get a head start on summer June is a great time to visit Costa Rica. Popular destinations have shed their crowds and you can enjoy some of the best trips in a more relaxed atmosphere with lower prices. The trees are sprouting fresh green leaves and the dry dusty desert of Guanacaste is transformed into lush tropical jungle. The rivers are filling up adding a class or two to the whitewater and flushing out the swimming holes under the waterfalls. The Pacific surge picks up creating more and bigger waves. We’re going out on a limb and predicting 2019 will be drier with a later more moderate start to the rainy season. No guarantee but we got it right when we predicted an early wet rainy season in 2017 and 2018. May 2018 was the rainiest May ever on record and the pattern of tropical lows bringing storms to the central mountains and normally dry Guanacaste and Nicoya Peninsula. The Caribbean (Atlantic slope) is wetter than the Pacific and in June continuous days of rain are possible although not as likely as November through January during the temporales del Atlantico. Extremes are also possible. For example June 2015 was exceptionally wet in the eastern zone and widespread flooding washed out roads and bridges. On both sides of Costa Rica the beaches and lowlands have high temperatures in the high 70’s to low 90’s (25 to 32 degrees C) and low temperatures in the 70’s to low 80’s F (22 to 28 degrees C). Head up in elevation to San José and the central valley temperatures drop 5-10 degrees F and temperatures at high elevations (Monteverde and Chirripó) can be 20 or even 30 degrees F lower. In general “green season” (rainy season) travel is gaining popularity for Costa Rica travelers, but June is not nearly as crowded as July. If you want the flexibility of traveling without reservations then June is a good choice and you should find good last minute availability. The rainy season and warmer weather in the U.S. and Canada mean fewer travelers in the tropics. When demand drops off so do prices and in June discounts of 20-30% are available for many accommodations. Some rental car companies run low season specials with similar discounts, but most transportation, activities and tours have fairly standard pricing year round. Airfare last minute sales (2-12 weeks in advance) have been fairly common in June for the past few years especially if your travel dates are flexible and you can fly on weekdays. Both July and August have similar weather patterns to June, but of the two July has fewer visitors and better discounts. If you’re willing to pay a little more February is drier on the Pacific beaches and the least crowded of the high season months. NOTE: June 2019 has about a 50% chance of hanging on to the slightly drier weather accompanying the minor El Niño which began in January. Día de San Pedro y San Pablo – Saint Peter and Saint Paul’s day marked by processions and masses.